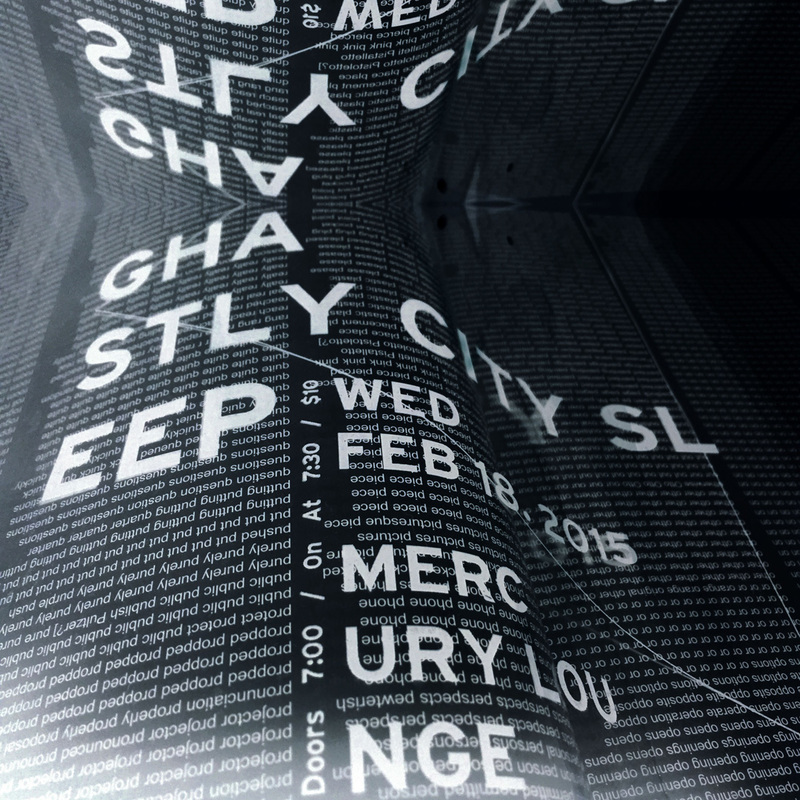 Ghastly is playing a home Brooklyn, NY show coming up. August 11th, a Tuesday eve. It should be a brilliantly summertime hot night. 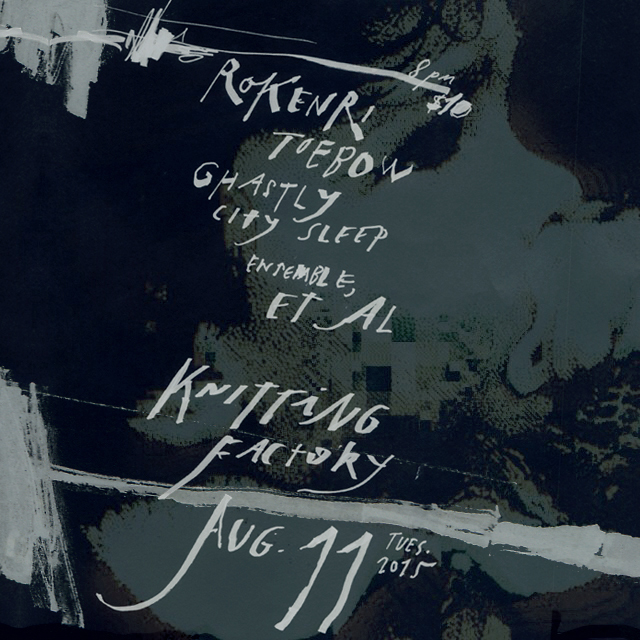 The show lineup is with talented friends: Rokenri, Toebow, and Ensemble, Et Al. Preorder tickets here! 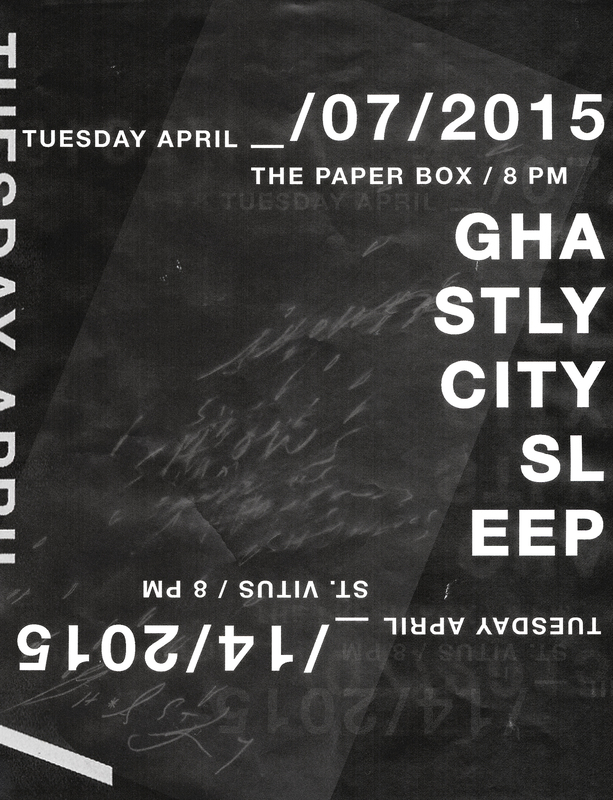 Show starts at 8pm, Ghastly is second on. Here’s a little video to help get your heads perked and out the door to the Knitting Factory; made from pieced together layers or unused segments from various Ghastly ongoings. Visual footage from shooting a music video for new track “DIFFERENCES IN ELECTRICITES”. Audio reworked from tucked tracks in “DIFFERENCES IN ELECTRICITIES” & “WHITE OWLS”. Bee / Ghastly City Sleep. Same goes for any event at this venue. Absolutely in love with their sound system, as well as experimentalism in music they support. Have to say, while mentioning inspiring stuff that keeps the youthful intrigue amidst, Sacred Bones label is a beasty monstertruck… just keeps getting better and better. Support them! Their artists and shows just aren’t slowing down here! 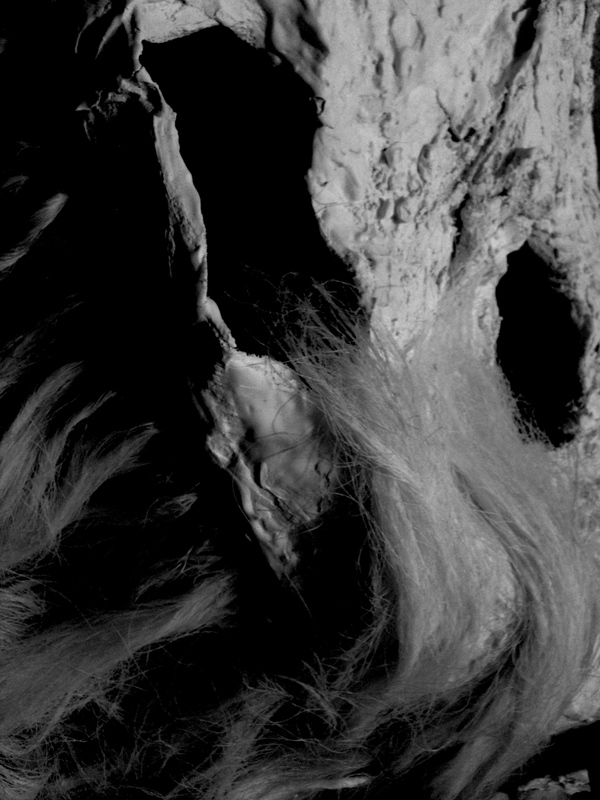 Both the Föllakzoid record-release show, as well as the Pharmakon, Prurient, Uniform, Marshstepper, Merzbow show re-instilled in me such excitement for music and artistic creativity. Today’s inspirations from the skull meanderings. We keep avoiding the blogland. Ooooo==pps. We are now looking for a new label to release our newest full-length album. It will be titled “Lulling Skulls”. We finished the record in its entirety last August… mastering and all. Magic Bullet and Ghastly unfortunately ventured along different paths. We hoped the album would have released by now obviously. So, in the current moments, we are in a limbo-searching phase. Hoping to find a solid home. Please check out a few of our newest tracks from “Lulling Skulls” here at our SOUNDCLOUD. Listen to em over and over, let em seep into your skull-walls a bit! Spread the word and the tunes as much as ya can. 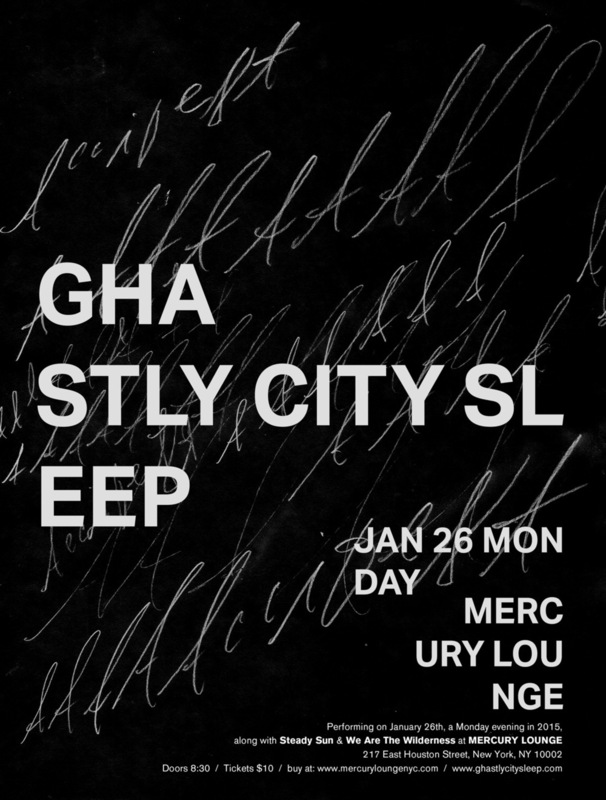 Here’s a few flyer designs from some of our most recently played New York shows for those you who were nowhere close. Hearts to all ah you! 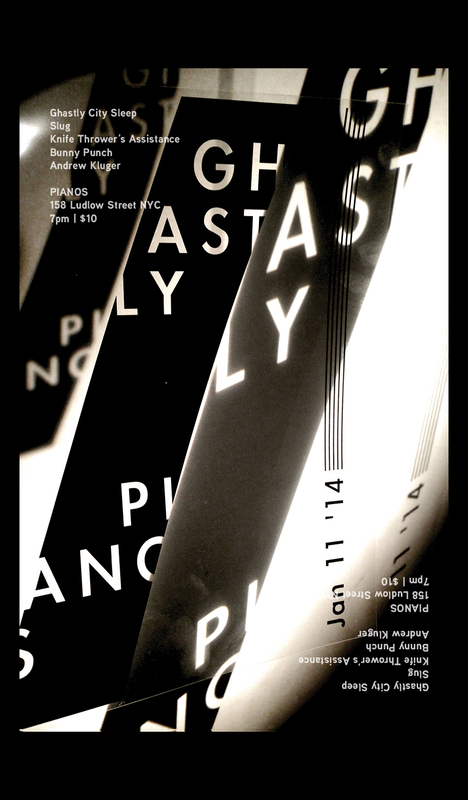 GHASTLY CITY SLEEP : Playing Sept. 17th, at PIANOS. FIRST NEWS!!! 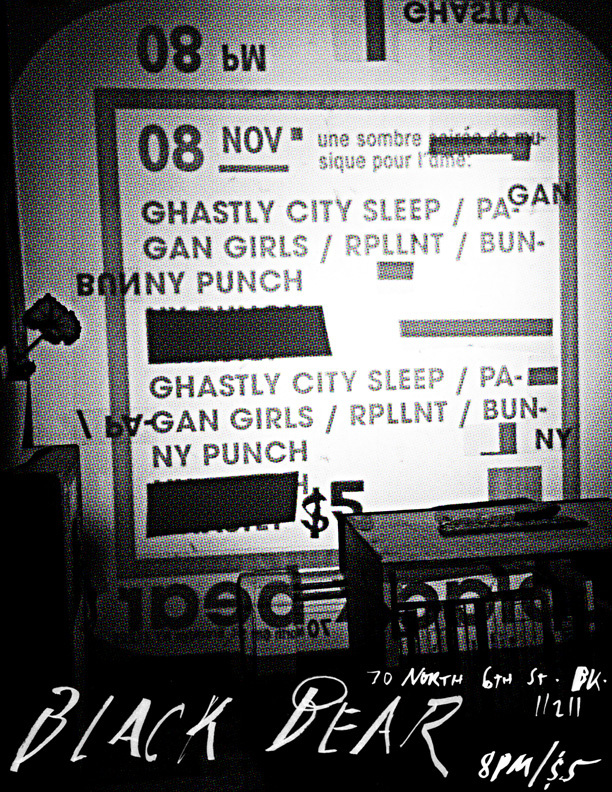 : Ghastly City Sleep is playing at PIANOS / SEPT 17th / doors 7pm : Ghastly 11pm. It will be my birthday jubilee as well! All New Yorkers please come out and get weird with us. Gawd it’s been foreves. We are returning excitedly after this crazy stint of writing and recording our newest, upcoming full length. It will be entitled LULLING SKULLS. I am just gonna start spurting out things for recap since I am the best at blogging! * We are missing our most stellar, cedar-spirited friend C.B. Houck. He has just become a father to a baby girl named Sage! Get in touch with him and shower them with love. He and Kimberly up and moved from New York down to the Outer Banks in North Carolina last month. * We have a new full-length tentatively scheduled to release in October on MAGIC BULLET RECORDS. We’re stoked to be working with Brent Eyestone again. We decided to bring back all the familiar faces from our past on this album. Of course, you know us, we went a little non-traditional… It was half mixed by Alex Aldi & half mixed by Andrew Schneider. In addition, we brought Alan Siegler back, both in the writing/performing process of these songs, as well as playing an engineering role along with Charles Burst, Mike Kutchman and us Ghastlies. * There have been some nice press releases already of a few tracks from the album. We are giddy-little moderne dancers over here. >> “Clumsy One” has been released as an exclusive premiere on DIFFUSER.FM (9.2.2014). Both The Deli Magazine (New York, Chicago, and LA) and New York Music Journal have blogged about this premiere as well! >> “White Owls” has been released as an exclusive premiere on NYLON GUYS MAGAZINE (7.28.2014). >> “Bent” has been released as an exclusive premiere on SPIN MAGAZINE (8.2.2013). * Yeliz and I are almost finished with the artwork and design for the vinyl. There is also a surprise 4th side addition to the album, which now clocks in probably somewhere around 70 minutes. Oh, and YES! It will be a double LP. Still waiting to receive test presses. Phewww. That’s probably enough spewings for now. We hope to get a lot more of these shows set up and performing live. Please get in touch to help in making that happen. We are really excited about all this new stuff. We truly feel it is our best work to date. Big bloody, pulpy hearts to all! >>>> Bee; & The Ghastlies. We are hoping for a photo-shoot in the next couple weeks. Some big tasks have been accomplished and stirring excitement within the secluded Ghastly world lately. Ran some tests. Don’t wanna give too much, but it’s far too hard not to! Additionally, we have scheduled some dates to wrap up ah hefty chunk of the foreverly-ongoing recording. Scattered across the Spring and Summer. It’s been a crazy long journey, with a lot of unforeseens, challenges, twists&turns, and whathaveyou’s. An uphill crawl. . . . .Can’t wait ta see the view. We of course need ah ton of help. So please get in touch if you have energy-things to offer! Happy Holidays and grandly suchnesses to all. The year 2014 is pretty much beyond the idea of future in every sense. Never knew things could get that far. We are stoked to be starting this new year off right! Playing a show in the early yawnings… January 11th at PIANOS in the Lower East Side of Manhattan. 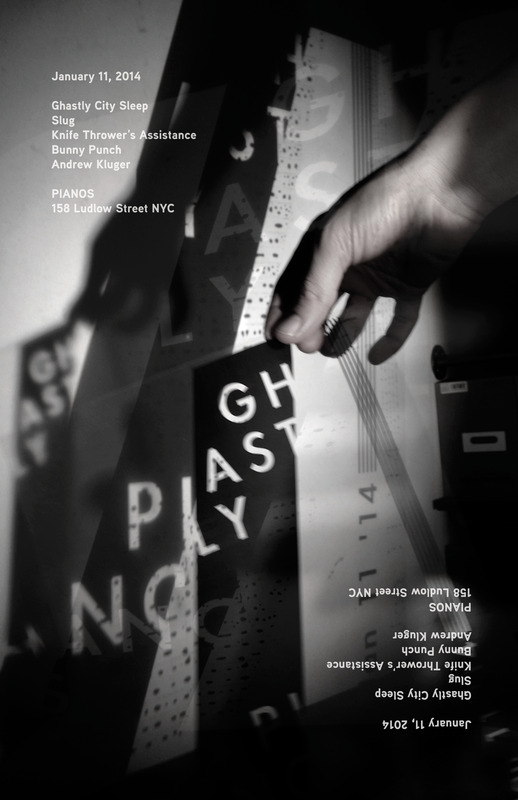 We are elated to have been asked to perform as part of Knife Thrower’s Assistance(‘s) month long Pianos Residency. Thank you, Heidi. In addition, Matt will be dancin’ the double dutch… he plays with dear friends Bunny Punch.